For the first time its 17-year history, consumer data tool GasBuddy is projecting that gasoline prices will be lower on the Fourth of July than they were on New Year's Day. The seasonal switcheroo is a result of crude oil's unexpected price decline in 2017 caused by a global glut of petroleum, which isn't going away anytime soon. For drivers, that translates into unforeseen savings just in time for the heart of the summer travel season. GasBuddy is projecting a nationwide average of $2.21 per gallon on July 4, which would be 12 cents lower than the price at the year's inception. That's also the lowest price on Independence Day since 2005. It's "quite the dramatic turnaround" after previous projections that gasoline would near $3 per gallon this summer, GasBuddy petroleum analyst Patrick DeHaan said. Americans save $4 million per day for every 1 cent drop, DeHaan said. "It really adds up." At least one station in 35 states is already offering gas for less than $2 per gallon. 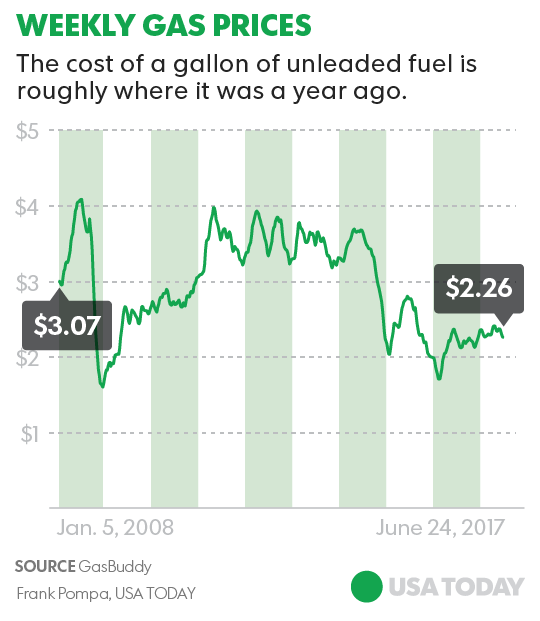 Gas is typically 47 cents more expensive on July 4 than on the previous Jan. 1, according to GasBuddy. The usual variation is largely due to lower demand in the wintertime. Prices have been diving for several weeks as global oil prices contract. Nationwide prices were averaging $2.26 on Tuesday afternoon, down 11.8 cents from a month earlier. The U.S. energy industry has continued pumping oil and natural gas at a steady clip, keeping supplies high despite an effort by the Organization of the Petroleum Exporting Countries (OPEC) to boost prices through production cuts. The price of West Texas Intermediate oil, the U.S. benchmark crude, has been trading in the $42 to $44 range over the last week. Less than a month ago, oil was trading above $50 and experts were projecting prices of $60 to $70 later this year. That now looks unlikely. DeHaan said gas prices probably already peaked for the year, barring a major hurricane that disrupts U.S. refineries.